Does it feel like Wrestlemania season? Is Dean Ambrose really leaving? Is that the real Dana Brooke? Did Triple H give Batista what he really really wants? Why is the possible reason that Kofi has never received a WWE Championship match before? 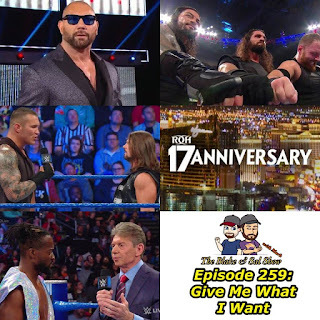 Find out what those questions are about, take a look at the news , a preview of the ROH 17th Anniversary PPV and even discussion about the Avengers: End Game and Aladdin trailers. Plus Sal makes a big announcement concerning Wrestlemania Weekend. Enjoy the show! 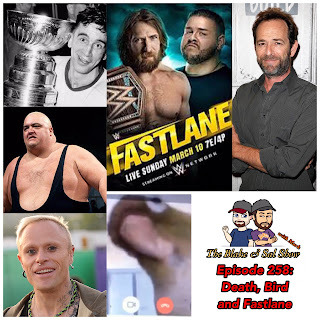 WWE Fastlane is this Sunday, and while the guys aren't thrilled about it, they cover it in full. 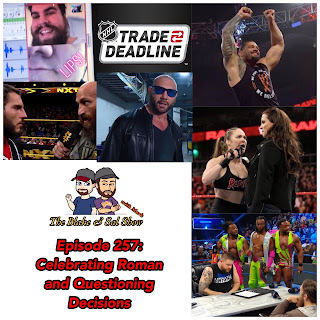 This is after covering the various celebrity deaths that happened this week, Mark reviews Green Book and they talk about the breaking news that Tomasso Ciampa will be undergoing neck surgery and where did they think things will from here with NXT Championship match at NXT Takeover: New York. All this and Sal's bird. Enjoy the show! Roman Reigns is in remission and the guys couldn't be happier. Before getting to that, the guys bring Scotty on to look at the NHL trade deadline news and they make fun of how Scotty doesn't know how to use his phone. After discussing the Reigns news, Blake reviews Fighting With My Family, they look at the releases and news that broke in the last week and then look at the craziness that was Raw, Smackdown and even NXT where matches get changed, titles get put down and tag team reunite. All that and the fact that Sal couldn't stop moving around. Enjoy!